Shawna Harding, who is currently Aiken’s best-known dressage rider, is spending the winter training at Black Forest Equestrian center just outside of town. Shawna’s recent riding and competition schedule has been rigorous, to say the least. She has been out on the show circuit with her horse, Come On III, a 1999 Danish Warmblood gelding, and Rigo, a 2001 Hanoverian gelding. Her success with both horses has taken her to the most prestigious dressage competitions in the United States – Gladstone, Devon, Palm Beach – as well as to Europe. Last spring she represented the U.S. in the F.E.I. 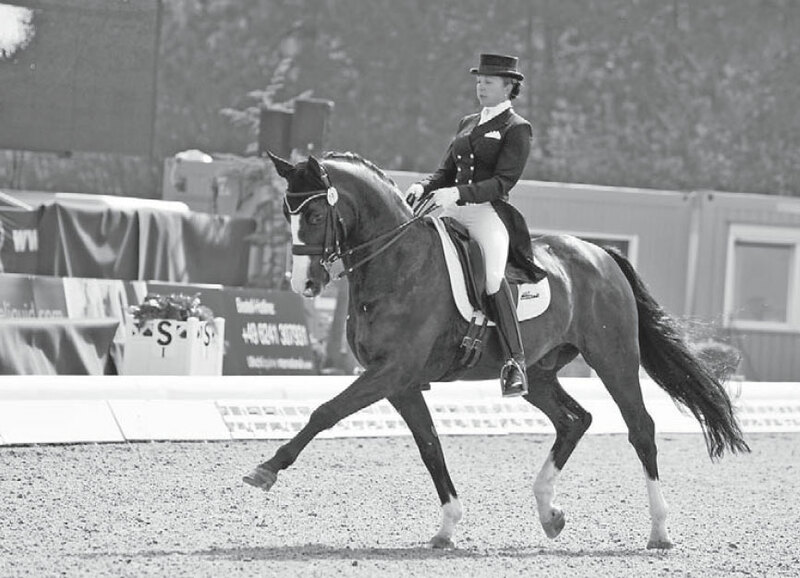 World Cup Finals in Hertogenbosch, the Netherlands, and the year before she spent several months in Europe, competing in the World Cup Finals in Leipzig, Germany as well as the CDI***** World Dressage Masters in Munich. Her wins and awards have been too numerous to list, both with Come On III, who competes at Grand Prix level, and with Tonya Rowe’s Rigo, who has been performing on the small tour. And what about Come On III, the horse that has taken her to so many world class competitions? Shawna might deserve a break, too, at least from the high pressure world of the show circuit. She says that she loves showing, especially in Europe where the atmosphere at competitions can be electrifying. This winter, Shawna says she is enjoying the other part of dressage that she loves, helping her students achieve their goals and training young horses. In Aiken, she has a small group of students, people who are serious about their dressage. But what is most rewarding to Shawna is working with the young horses. “The biggest thing is having a really good program,” she says. “The horses in my program are well taken care of, and they have their paddock time, because I think turnout is very important. I have a structured way of training and bringing horses up so that every day they know what’s going to happen. Riding is not easy, and there are really no easy horses. There are just some that are less difficult than others. My program really works, and I have proven that. The horses know that they’re not going to get wrong signals, or any wishywashy kind of riding around. “I really enjoy what I do,” she continues. “I love being with the young horses and training them up. My biggest thrill is doing something like putting a flying change on the horse, and having him learn it very quickly. You have that connection, that feeling of communication. I put with me riding them. I think that makes all the difference." Shawna Harding teaches and trains at Black Forest Equestrian Center in Aiken. Keep up with her on her Facebook page: www. facebook.com/shawnahardingdressage. Or send her an email at shawnahardingdressage@gmail.com.